Two University of Washington undergraduates have won a $10,000 Lemelson-MIT Student Prize for gloves that can translate sign language into text or speech. The Lemelson-MIT Student Prize is a nationwide search for the most inventive undergraduate and graduate students. This year, UW sophomores Navid Azodi and Thomas Pryor — who are studying business administration and aeronautics and astronautics engineering, respectively — won the “Use It” undergraduate category that recognizes technology-based inventions to improve consumer devices. Their invention, “SignAloud,” is a pair of gloves that can recognize hand gestures that correspond to words and phrases in American Sign Language. 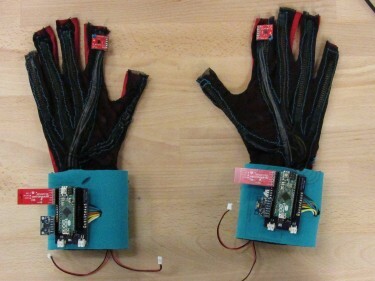 Each glove contains sensors that record hand position and movement and send data wirelessly via Bluetooth to a central computer. The computer looks at the gesture data through various sequential statistical regressions, similar to a neural network. If the data match a gesture, then the associated word or phrase is spoken through a speaker. They honed their prototype in the UW CoMotion MakerSpace — a campus space that offers communal tools and equipment and opportunities for students to tinker, create and innovate. For Azodi and Pryor, that meant finding a way to translate American Sign Language into a verbal form instantaneously and in an ergonomic fashion. “Many of the sign language translation devices already out there are not practical for everyday use. Some use video input, while others have sensors that cover the user’s entire arm or body,” said Pryor, an undergraduate researcher in the Composite Structures Laboratory in the Department of Aeronautics & Astronautics and software lead for the Husky Robotics Team. “Our gloves are lightweight, compact and worn on the hands, but ergonomic enough to use as an everyday accessory, similar to hearing aids or contact lenses,” said Pryor. The duo met in the dorms during their freshman year and discovered they both had a passion for invention and problem solving. Azodi has technical experience as a systems intern at NASA, a technology lead for UW Information Technology and a campus representative for Apple. His long history of volunteer work — which includes organizing dozens of blood drives and working with Seattle Union Gospel Mission, Northwest Harvest and Ethiopia Reads — gave motivation to build a device that would have real-world impact. The team received support and mentoring from Mike Clarke, who manages the CoMotion MakerSpace and met the students after one asked for help with some soldering equipment that turned out to be broken. “We disassembled it and fixed it together while talking about their sign language translation project. I recognized from working and talking with Thomas and Navid that they were standouts and that the invention they made was really impressive,” Clarke said. Pryor and Azodi’s first target audience is the deaf and hard-of-hearing community and those interested in learning and working with American Sign Language. But the gloves could also be commercialized for use in other fields, including medical technology to monitor stroke patients during rehabilitation, gesture control and enhanced dexterity in virtual reality. Their “Use It” Student Prize is one of seven awarded by the Lemelson-MIT Program this year. Each winning team of undergraduates will receive $10,000, and each graduate student winner will receive $15,000. The winners of this year’s competition were selected from a diverse and highly competitive applicant pool of students from 77 colleges and universities across the country. “This year’s Lemelson-MIT Student Prize winners have outstanding portfolios of inventive work,” said Lemelson-MIT Program faculty director Michael Cima. “Their passion for solving problems through invention is matched by their commitment to mentoring the next generation of inventors.” Students interested in applying for the 2017 Lemelson-MIT Student Prize can complete this interest form.